Florida home without a pool? Is it even so? Having a swimming pool or any type of water feature in your backyard, especially in the Florida area means relaxation, refreshment and cooling off, especially during the hot months. As of the publishing of this post there are currently about 300 homes in Jupiter Florida that have a pool or are at least listed as having a pool. These homes are priced from $240,000 to nearly $11 million and everywhere in between. Many of these properties are in communities and gated neighborhoods, country club communities or simple single-family homes in open neighborhoods. You really can find exactly what you’re looking for in any price range in the Jupiter Florida area. Many of these homes feature three and four bedroom floor plans or even seven or eight bedroom floor plans with over 10,000 ft.² of living space. Having a home with a pool means you don’t have to run to the community center, the local YMCA or recreational facility when you want to splash around in a pool. You can cool off in the comfort of your own home or at least your own backyard. Many of the homes in Florida have a covered lanai that is completely screened in with a swimming pool and spa area. This keeps you away from any bugs or irritants in the air, allergens, and anything else that might want to get in and mess up your pool. This also protects from any trees, needles or leaves that want to fall into your pool come Autumn. The majority of homes with swimming pools in Jupiter Florida range from $1 million-$3 million but that doesn’t mean that there are many lower-priced homes with pools as well. There are many homes in the $500,000-$600,000 range that feature 4 to 5 bedrooms, between 2000-3500 ft.² of living space with a beautiful screened in and fenced backyard with the lanai, swimming pool and a possible hot. The spaces create a luxurious outdoor living area with the privacy of your own home. 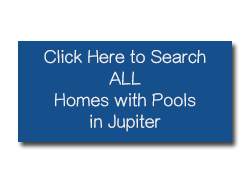 Start your online search here for free for all homes with pools in Jupiter Florida.